One thing I like about Ascott Makati is its great location. It is near large shopping malls (Rustan’s, Glorietta Mall and SM) and there’s a wide variety of restaurants outside Ascott. While we love the food at Ascott, we simply couldn’t afford to eat hotel food all the time during our overnight stay there. On the day that we checked in, we had lunch and dinner outside the hotel. 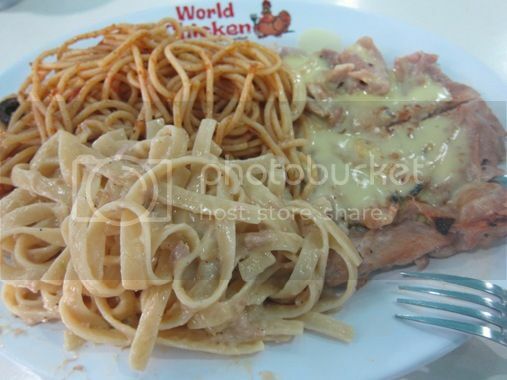 We went to World Chicken at the Food Choices of Glorietta 4 to eat lunch. We miss eating there! Hubby and I were regular customers of this World Chicken branch when we were still renting a place in Mandaluyong several years ago. While our place then was nearer Shangri-la Mall and SM Megamall, we would often go malling at Glorietta Mall because we liked it there. World Chicken’s flame-grilled chicken is succulent, tender and full of flavor. There are also different sauces to choose from, but it’s always Mornay Cheese for us. The sidings are also generous and satisfying. The little boy was not really hungry when we went to Food Choices, so I just shared my food with him. It was not really a good move because I ended up craving for more! Lol! Do you like World Chicken, too? This entry was posted in American Cuisine, Grilled Chicken. Bookmark the permalink. 4 Responses to Reunited with World Chicken! I never order the one with two sidings coz i cant finish it. Hehe. 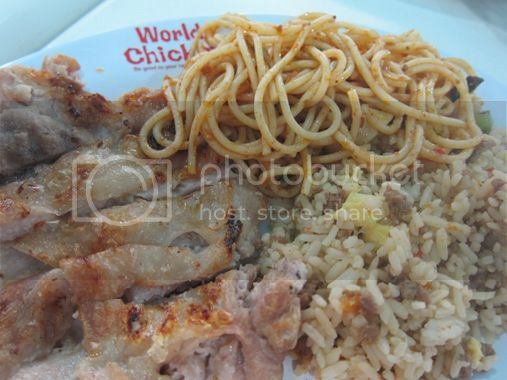 I often get chicken with ranch bbq sauce and asian noodles (but its a too oily). Their puttanesca the last time i ate there was kinda bland though. I miss eating there!